Emmy® winner John Ritter (TV’s “Three’s Company”) and four-time Golden Globe® nominee Katey Sagal (TV’s “Married with Children”) star as frazzled parents trying to raise three teenagers in the hilarious television comedy “8 Simple Rules for Dating My Teenage Daughter.” Re-live the laughs with all 24 episodes from the hit show’s second season, which originally aired during the 2003-2004 television season on ABC, on DVD. During its three year run, the show received an Emmy® (Outstanding Cinematography for a Multi-Camera Series) and a People’s Choice Award (Favorite New TV Comedy Series). 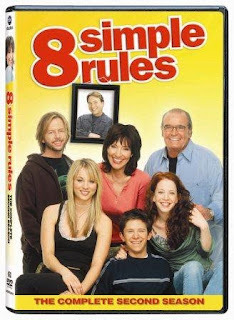 8 Simple Rules for Dating My Teenage Daughter: Season Two 3-disc set hits store shelves on May 19, 2009 for the suggested retail price of $29.98. I love this show even though I don't get to see it often. At least I was able to catch up on the show with this DVD! I've always liked John Ritter and Katey Sagal is too funny!! Special thanks to Bender Helper Impact for providing me with this DVD! This giveaway will end on June 7th, 2009 at midnight EST. I don't think I ever watched that show. I miss John Ritter. He was a very talented actor.